We now offer our popular Deluxe Bucket Seats and Fold & Tumble Rear Seat as a complete set along with our NEW Locking Security Console for added value. The front buckets and rear bench are all made of the same Denim Weave Vinyl material to ensure a perfect match. The Locking Security Center Console also has the same material used to wrap the armrest cushion on the top of the console. The material is water & weather resistant making it perfect for those who like to ride with the top off. NOTE: Due to the width/length of this console, slight modifications MAY be required. This includes drilling new holes for the inner seat belt holes (factory holes will be covered up with console on 69-77 Broncos), and also if you want the console to sit further forward, it will need to be raised off the floor slightly as the cup holders will interfere with the tunnel cover. After doing a ton of research to find best seats for my truck, I decided to go with the complete seat set from Toms. With that said I have had the seats in my truck for a few months and am happy overall with them. The seat material itself (vinyl denim) appears to be holding up well so far, as for the seat frames themselves time will tell. The seat backs on my seats are not tight, meaning there is some front to back play with the seat back. This is something I would expect out of a worn in seat vs. a brand new piece. The rear seat fits perfectly and installs as it should. The fold and tumble option is the only way to go if you ever want to haul anything in the back of you Bronco. Access to the rear seat is a major issue with this set as the front seats do not flip forward, so you are left squeezing between the door and the front seat. This could be remedied by possibly mounting the passenger seat a little farther forward, but is deffinatly worth a consideration if you have frequent passengers. Overall I am pleased with the seats they are comfortable (both front and back) and look great. 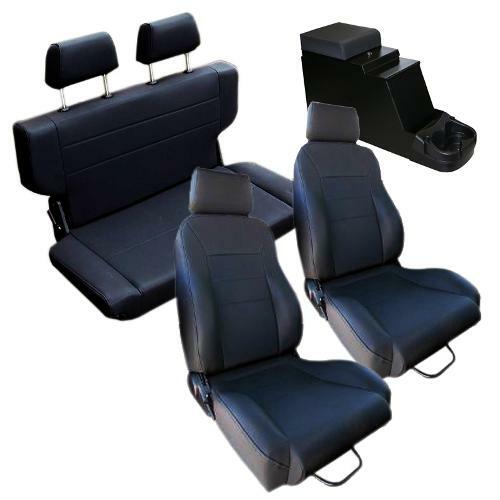 If you are looking for modern style seating for your Bronco I would recommend this set. Just got my new seats, purchased the premium set. After opening them they look nice and material feels good. I will post another review when I have had them a few months to see how I like them. My only concern is that I am going to have to remove my console because the drivers seat rubs the side of the console pretty tight! In fact it makes it hard to line up the factory bolt holes for the seat. I hate loosing the console but better than seat wearing out. The name of the console just in case someone else has the same thing is MAX-BUILT it measure 8.5" wide in the front and the seat bun is hanging over 1/2" into the console. If you slide the seat all the way forward then the seat can hang over the cup holder area, I am not that short! This console is just not going to work with these seats. If your buying TBP console I would get the measurements first if using it with these seats. I call them and they told me these seats rub their console just a little? Hum! Well, overall the seats themselves are whats important and they look to be a nice addition to my 77. *TBP NOTE: We have checked and our console does not rub between these seats. Apologies if someone here indicated otherwise.